i admit i'm a bit of a stock collector! Proud member South Australian Railway Modellers Assoc. I changed from OO in 1976. Not sure why exactly. A mix of things. The diea of more in the space was attractive. I relished a totally new challenge. And there was "PC49" a member at Northolt, who extolled its virtues at any opportunity. And there was some evidence of the avaiability of decent (OK not perhaps by today's higher standards) quailty stock becoming avialable - for LMS fans like me at least. Farish was starting to get under way and the kit market was birthing. I was also inspired by seeing Fort Ness on the exhibition circuit. Must be part of where my more recent Scottish interest came from. I noticed that I started this thread back in November last year since then I had a short burst a few weeks ago at buying OO Gauge, I have been in and out of N gauge for many years but after looking at OO gauge again I think it looks very toy like so I got rid of it. Think you've got a very valid point there ORB, let alone 00 gauge, whenever I see 0 gauge layouts in magazines etc they (with the odd exception) always look very crude, chunky and unconvincing. Interesting. I admit that I could be very tempted by O Guage. I like its potential magnificence. And my wife likes it! The issues include cost and space. In my modest house I could only do something very modest so I suppose I would not be looking at too mch stock etc (stop laughing). Another issue is my hand tremor. small bits are easier to handle if they are bigger, but mistakes and omisions would be very obvious. At least in N small details hardly show at exhibition distances - so can often be left off. And interesting comparison for me was that my Farish Jubilee arrived at the same time as a Union Mills 2P. Different approaches. In many ways I prefer the UM approach. It is robust and can be handled easily. And it still looks good. At least in N small details hardly show at exhibition distances - so can often be left off. Maybe that's it. When you view N gauge it's like you viewing the real thing form a considerable distance, so minor details would be less noticeable. However, looking at 0 gauge (and to a lesser extent 00) is like being much closer to the real thing where you would naturally see a lot more detail, so if it isn't there it registers as less realistic? Take people for instance, imagine you're walking towards a real person so they get bigger in your field of vision as you get closer: at N gauge distance you would be far enough away from the person to see skin colour and clothing colour, but probably not much else; at 00 size you'd be able to make out some facial details and clothes/footwear styling; at 0 gauge distance you'd be able to make out clear facial expressions, hair styles, and detailed clothing items. Therefore if these details are missing when viewing a model your brain registers it as more toy-like? Had a collection of Graham Farish Locos and rolling stock from years ago and so to save money on returning to the hobby stuck with N-gauge,to a degree prefer 00 as you can get more detail in but still enjoy the challenge of modeling in a smaller scale. I really think there's something in what you say, Sprintex. I've always found those large scale layouts strangely lifeless - thinking here of Gauge 1 or LGB layouts that are fully scenic. And I think the key difference is the people. Because the larger the scale, the harder it is to treat model figures as impressionist. Or to put it another way, the bigger they are, the more obvious it is that they're not real!! It's a curious effect, as logic would suggest that the more detail a model has, the more convincingly realistic it is. Personally I find a Union Mills G2 chugging along somehow more entrancing than a huge Gauge 3 set up where you can see the cutlery in the dining car. to put watches on the crew figures and eartags on farm animal figures! two British RTR suppliers, although their detailing has reached a high standard. could do detailing themselves if wanted. I agree and think a reliable mechanism is way more important than super detail. My eyesight is not that good that I would be able to see fine detail on an N Gauge model so I would be more than happy to sacrifice detail for reliability, from the many people I know that are involved in this hobby I would say 99% of them agree. I started modelling in N gauge just over a year ago. For the last 10-12 years I've been building locos etc from kits in 0 gauge and had improved my skills with etched brass etc. having tackled some relatively complex locos. However, I thought I might like to try my hand at a diesel - a class 24 to be precise - but when I started to cost the project and added up kit, wheels, motor etc. and reached £600, I decided that this was a step too far. Also, with the increasing tendency for 0 gauge to move into to RTR sphere with locos at £1500-£3000 each and the dreasing number of new kits reaching the market, the time had come to call a halt. So, a Graham Farish class 24 bought on ebay for just £57 started me off. With the chance to run 5 coach trains for a reasonable distance in the same space that a similar train in 0 gauge virtually filled and I was hooked. Now, anybody looking for any 0 gauge stock ?!! I wanted a layout which went around my desk. I looked into Z gauge but the availability of everything is poor, the selection is limited and the cost is so high. When I visited my old stomping ground about 2 years ago, I stopped in at The Engine Shed/Guagemaster in Ford, Arundel and discovered Kato track - the seed was sown... After going to The Loco Shed in North Manchester to check sizes of stuff out, I settled on N (although I very nearly walked away with a T gauge set...) I like the compromise on size mixed with the vast amount of modern rolling stock/diesels. I also like all the weathered stuff you can buy. Playing with hand-me-down OO a long time ago gave me an idea of what I wanted from my rolling stock, except this time I could make a clean start with huge, convincing rakes of wagons in a manageable space. I think it's been summed up quite nicely by everybody. 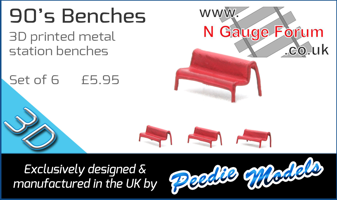 Modelling railways is about compromise, and N gauge is perfect in almost every way. Fine detail can't be seen so it isn't absolutely necessary, although I must admit to being impressed by the detail the RTR manufacturers have achieved. I recently inspected a Farish Arriva Trains Class 150 with my magnifying glass and was delighted with the clarity of lettering, and astounded to see it was routed to Shrewsbury at one end, and Cardiff at the other! 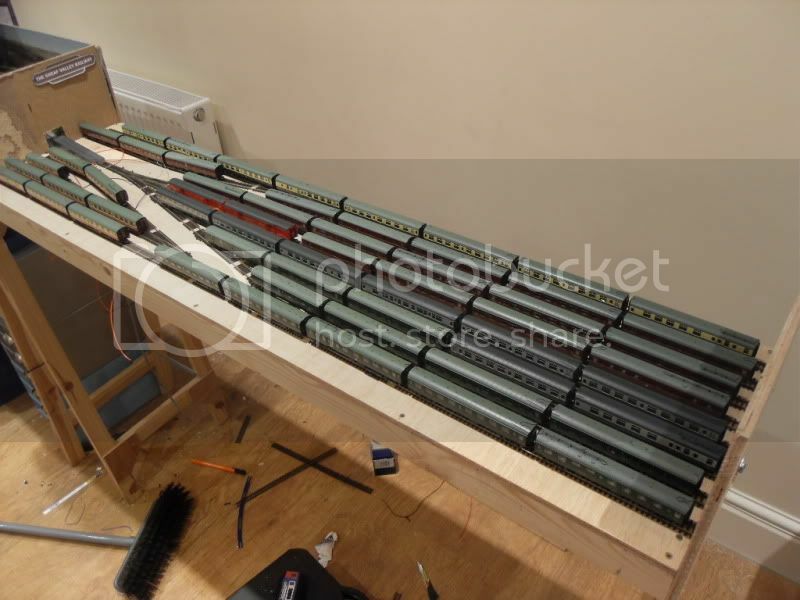 Then of course many of us want to run trains on a main line, rather than a country branch, and this is another compromise, even in N gauge, but almost impossible in the larger scales unless you're lucky enough to have a room about 30 feet long.